This set of Aerodynamics Questions and Answers for Aptitude test focuses on “Incompressible Flow in Duct”. Explanation: Generally, the flow field properties are uniform across any cross section and hence, they vary only in x-direction. All the flow parameters are assumed to be the function of x. A=A(x), V=V(x), p=p(x) and since they vary only in one direction they are called quasi 1D flow. Explanation: In incompressible flow, the density remains constant because of which the fluids cannot be compressed and are called as incompressible fluids. Water is the best example of incompressible fluids. But still some extent we can compressible water. Explanation: When the flow enters the wind tunnel (convergent-divergent) with a velocity V1 and pressure P1. The velocity increases and the pressure decreases at the minimum area section called the throat. Pressure is minimum at the throat. 4. The below figure shows which of the following wind tunnel? 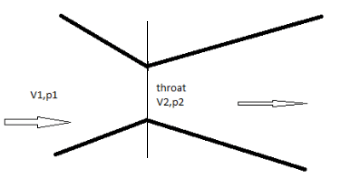 Explanation: The velocity increases in the convergent duct (V1) and the reaches V2 at the throat and the pressure becomes minimum at the throat condition. In the divergent section, the velocity decreases and the pressure begin to increases. Explanation: It is the characteristics of the venturi duct that the pressure at the throat is lower than the pressure at the inlet (ambient pressure). Because of this characteristic, it has many applications in the aerodynamics. Explanation: In venturi duct, the pressure at the throat(p2) is lower than the pressure at the inlet(p1). The pressure difference p2-p1 helps to force the fuel into the airstream and mix it with the airstream downstream of the throat. 7. Which of the following parameter can be measured using venturi? Explanation: Using venturi, velocity can be measured. We can calculate the pressure difference using venturi. In the duct, we can place pressure gauge which will directly give us the pressure difference (p2-p1). This pressure difference can be related to velocity using Bernoulli’s equation and hence, the velocity can be calculated. 8. Which of the following is an application of incompressible flow in a duct? Explanation: Low speed wind tunnel is a large venturi where the airfoil is driven by a fan connected to some type of motor drive. The wind tunnel fan is similar to the propeller of an aircraft and is designed to draw the airflow through the tunnel circuit. Explanation: In an open circuit wind tunnel, the air is directly drawn from the atmosphere, and again sent back to the atmosphere. Also, the velocity at the inlet is greater than exhaust and the pressure is greater at the exhaust. Explanation: The purpose of the diffuser is to reduce the velocity. In order to decrease the velocity, the wind tunnel is designed in such a way that the area in the divergent section decreases and the pressure in this section increases further. 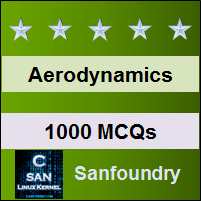 To practice all areas of Aerodynamics for Aptitude test, here is complete set of 1000+ Multiple Choice Questions and Answers.